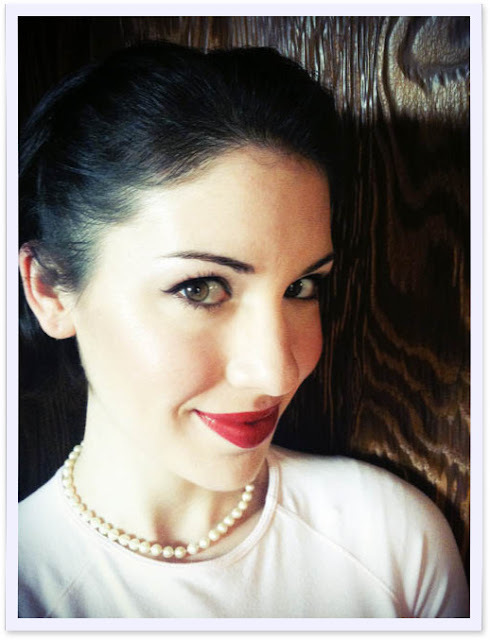 Lyndsay Johnson: A crazed creative does laundry in pearls and learns to just let it go already! A crazed creative does laundry in pearls and learns to just let it go already! (There's a crazed look in her eye, I tell ya! I will openly admit that I have hard time with "creative" blogs. I get a pit in my stomach when I see beautiful blogs belonging to fantastic fabric fashioners, printing press princesses, daring designs divas. I want to do every single one of those things that I see. And I want to do them flawlessly. It really is a problem. Sometimes I make myself go to their sites and give myself a figurative slap on the hand. I say: "Self, it's not all about you right now. You do a LOT. And you do it well. Get over it. Leave some of it for someone else who does it better and has the time. Jeesh!" But I still find myself lurking in self-loathing on How About Orange, and Oh Hello Friend. Then I have to remind myself that CLEARLY I am creative. I know this. And it is my blessing. CLEARLY I try to dip my paintbrush into too many pots. This is my curse. I will always want to paint/print/design/photograph/hum/write/sew/craft/code/create. There's no getting around it. But I haven't the time for it all. I have the longest and most well-loved relationship with graphic design. That's where I can boast a full-bodied education steeped in Garamond and gradients, baselines and bleeds. And I hang my hat on its comfortable hook, happily. But! Oh... the "but." When I find other creative folk out there in the wide world of the web who seem to effortlessly have the ability to "do it all," it trips me up. My mind starts a frenzy of all of the unfinished projects and intended efforts that I have to finish and master. This is SO SILLY of me! My only comfort comes in thinking that maybe I am a little bit of a "Crazed Creative." I am. Maybe a lot of one. Wes also exhibits many of these characteristics. I love this about him. It's what makes him great at what he does. But he always thinks he needs to be doing way more. But it's what keeps him great at what he does. It's probably why we compliment each other so well. **Crazed Creatives get off the hook for this behavior, because we don't really know that we are doing this. We don't really intend to make anyone feel inferior by flaunting our overflowing amount of creative energy, only to pout and say we aren't creative enough. It's like a deficiency. And we lack many other useful skills, like how to be doctors and nurses, investment bankers and Harvard MBAs, and in my case a consistently successful cook. And if I sew something, it never involves a pattern, and I won't ever learn to read music, so that it takes me twice as long to complete these tasks, out of sheer pride that my creative skills should be able to master these things organically. You see? So please just pat us on the head and sigh. Are you still reading? Where am I going with all of this blabbering? Right on over to Casey Brown Designs. I found Casey HERE on YouTube one afternoon completely by accident. I can't even retrace my steps. And I will tell you why this find is significant for me. I watched all of her delightful videos on achieving an Authentic Vintage Self, and really really liked her! I am not a vintage kind of a gal. I am decidedly modern. But I enjoy it on others, and love vintage/vintage-inspired and heirloom jewelry/accessories, if they have special meaning (they compliment Modern so nicely). So while I was watching Casey I found myself wanting to try the "prefect red lip." Just for fun. FOR FUN! No pressure to be a new aficionado on a perfect pout. Just wanted to see if I could do it. And it was pretty, but not for me. So after watching many of her videos, I decided I wanted to get to know Casey a little more. I found her website. Uh oh. She's one of "those." She does it all. And she has TIME for it. She doesn't have children yet (the other completely legitimate reason I can proffer myself for not starting/completing projects). And because I found her through the "back door," I didn't immediately judge her. I went to her About section, and found that she is surprisingly like me. And I smiled. A big smile! I felt relieved. Not as crazy. Others have done this for me—helped me get over myself and just appreciate. Dandee, A Day that Is Dessert, NieNie (and she was the hardest in the beginning to read, but so worth it). They have helped me realize that I can enjoy the talents of other creative women around me without needing to try to replicate those creative efforts all. the. time. I can benefit from them without having to be them. I can test their creative waters, become inspired, take some gorgeous photos, send a perfectly packaged treat, mother in new and wonderful ways. Then I can comfrotably go back to being me, a little more enriched. I totally understand where you're coming from. I'm not nearly as creative as you are, but I yearn for more. More something in my everyday! I think it's so cute that you did the laundry in pearls and red lipstick! Why not, I say! I've seen your blog button on a couple sites *and* seen you there (Nie Nie, Cardigan Empire and I'm sure somewhere else) but this is the first time I've visited. I'm hooked :) I'll be adding you to my bloglist! You look wonderful in the retro look, even if retro isn't your "thing", it suits you! You are not alone here, dear. I too, have had these same feelings. There are so many amazing, talented + inspiring women in blogland. And guess what? You are one of them. Your talents never cease to amaze me. And I'm not only talking about the blog designing. Also things like your mothering. The care you give your little family. Your faith. Your perspective on the world. It all has me question every now + then, "how does Lyndsay do it all?" p.s. If I looked as ravishing in red lipstick as you, I'd wear it everyday. You are so beautiful. Ok, so I read NieNie and I just saw your button on her blog. I am laughing at your video by the way, haha. I have a 3 month old and I can just relate. "ok ok ok, I won't sing" haha. Now. I am so glad there are other people that share my anxiety when it comes to designing or being creative! Blogging does not help me because it just makes it worse...the guilt, frustration, etc. when I see all this stuff that people do that I am supposed to be doing. My mom is creative and awesome. I do have some her gene in me. I LOVE TO DECORATE and CREATE! I feel overwhelmed when I am not excelling at this. I don't understand how others do it ALL! And quite honestly, this week, I have been wanting to make a million things and I don't know where to begin. I want to re-decorate my house. make me some new stylish clothes, necklaces, hair clips, etc. I know I can do it, I just don't know how!? You were made to wear red lippy! Oh Lyndsay, you are so one of those people I get the anxious/guilty feeling with because you do it all! At least to me. Seriously, I think I've mentioned this to Rome on more than one occasion. I don't know how you do it, but I aim to be more like you. My creative side is still blossoming but maybe if I live by you your talents will rub off on me! I love you and your red lips! Funny that you feel that way....I felt that way when I first discovered YOUR blog (which was only about a month ago). In the mean time, red lipstick always helps. I couldn't agree or feel more the same as YOU! Sick sick sick to my tummy and still I lurk, and enjoy the finds and talents (including yours!!) they share. Hope you are loving Cali! dressing as a princess and setting about household work. and of course i very much sympathize with your creative energy. thanks for your thoughts! and please please please tell me where that how-to on the felt mobile is!!! i would so appreciate it.